Rating: 6.6/10. From 100 votes. The 42 from the left. Those specious criticisms aside, it appeared Glock had built a fine compact pistol that’s chambered for a very practical caliber. I obtained one from Glock to see for myself. 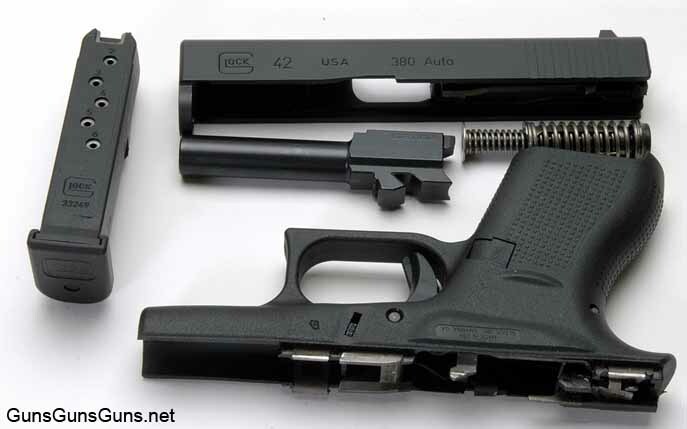 The 42 remains true to the Glock design, from its Safe-Action Trigger, slide, frame and magazine, to the disassembly method. 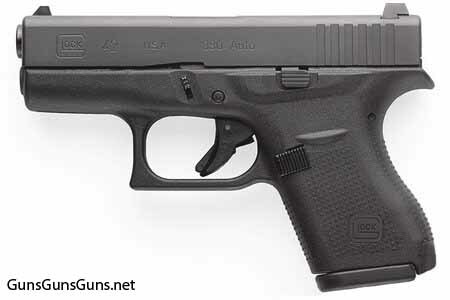 The 42 holds six rounds of .380 ACP ammo in the traditional Glock polymer magazine. Its large, horizontally-grooved magazine catch is reversible, following Glock’s current Gen4 design. The slide features a blackened nitration finish and slides on four metal rails embedded into the polymer frame. The barrel, with a blackened and also polished nitration finish, features hexagonal rifling. The 42 is striker-fired and operates on a short recoil system, with the barrel hood locking into the large ejection port window. 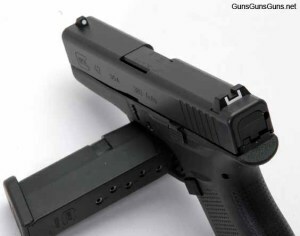 The barrel hood (facing the right) is marked at the lower right by Glock’s logo. Next is “US” and then an outline of the state of Geogia. The top left side of the hood is marked “.380 AUTO,” followed by a punch mark within a pentagon that indicates the grade of steel. The gun’s serial number is stamped on the barrel’s top right vertical side. In a matching location on the left side you’ll find an ISO Coding number. The author’s 42 from the right. The 42 employs a captive dual-recoil spring system. The white-dot front sight is pinned in the slide, and the square-notch, outlined-in-white rear sight is in a dovetail cut, allowing windage adjustments. An external spring-loaded extractor is in the port’s center right. The extractor also serves as a loaded-chamber indicator because a chambered cartridge forces the extractor to cam outward at its front, where you can see and/or feel it. There are six vertical grasping grooves at the slide’s rear. 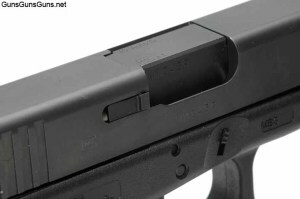 Markings on the slide’s left include Glock’s logo, then “42” followed by “USA” and “.380 Auto.” On the slide’s right, the serial number is stamped just beneath the ejection port. Between the extractor and the grasping grooves Glock stamped a capital letter “P” (for Proof) encircled by the Georgia outline. The firing pin safety plunger is larger than that found in other Glock models. It’s beveled on it’s contact area and is rectangular in shape. Also, inside the slide you’ll find another ISO coding number. The back retaining plate is faintly horizontally grooved. All frame gripping areas are pebbled in Glock’s Gen4 style, but the pebbling pyramids here are more subdued—i.e., less pointed—than those found on the larger Gen4 pistols. This makes sense for a pistol people will most likely carry close to their body in a pocket, holster or handbag. The front strap is pebbled, too. The trigger guard is squared, with a slight hook on its lower forward face, which offers faint horizontal grooving as an aid to those who hook a support-hand finger(s) around the trigger guard in a two-handed shooting grip. Two cross pins hold the trigger assembly to the frame. The front sight is pinned and the rear sight dovetailed. Also worth noting: The 42’s frame molding seams are almost fully flush to the frame. I often find this seam to be more prominent on other Glock models, and in the grip area they can quickly grow annoying if I’m doing lots of drawing and/or shooting because my off-hand index finger rubs on the seam. Glock did good work here! 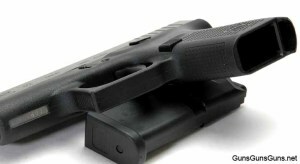 The frame bulges slightly out on both sides at the top of the grip area, and the right-side swell is marked “Made in USA, Glock Inc. Smyrna GA.” Another Georgia outline is stamped further forward above the trigger guard. There’s a plus to the bulges. Beneath them, Glock left the frame smooth and then added a horizontal ridge. This creates a slight finger and thumb guide. Also, the left-side bulge protrudes enough to deter an inadvertent activation of the frame-mounted, horizontally-grooved slide stop. The slide stop, magazine release and take-down lever are in the same locations and are the same sizes and shapes as those found on the Gen4 pistols. The backstrap has a sightly curved lip to its beavertail. The backstrap’s lower end extends down below the magazine well’s mouth so that when you insert a magazine, this end covers the rear of the thick, flat base pad. The frame is also shortened on its other three sides so that the magazine base plate doesn’t extend past the frame’s sides, but you can still grip the base pad if necessary. The base pad is removable and held in place by matching grooving and an interlocking plate. The magazine is fully metal-lined within a polymer shell and holds six rounds. Four staggered cartridge witness holes, numbered 4–6, are on the magazine’s rear. The magazine follower is polymer. Both supplied magazines were not at all difficult to load, which is good because no magazine loader comes with the gun. Glock does include a nylon brush, polymer cleaning rod, trigger lock and owner’s manual, all in a lockable, hard-sided Glock case. Disassembly is classic Glock. Once you’ve verified the pistol is empty, close the slide and pull the trigger, which releases the partially-cocked striker. Next, slightly retract the slide, pull down on the frame-mounted slide lock against the spring pressure and, while holding it down, pull the slide forward and off the frame. (The slide lock is serrated on both ends to aid disassembly.) Next, slightly compress the captive dual recoil spring to remove it. You can then lift or drop the barrel out of the slide and remove it rearward. 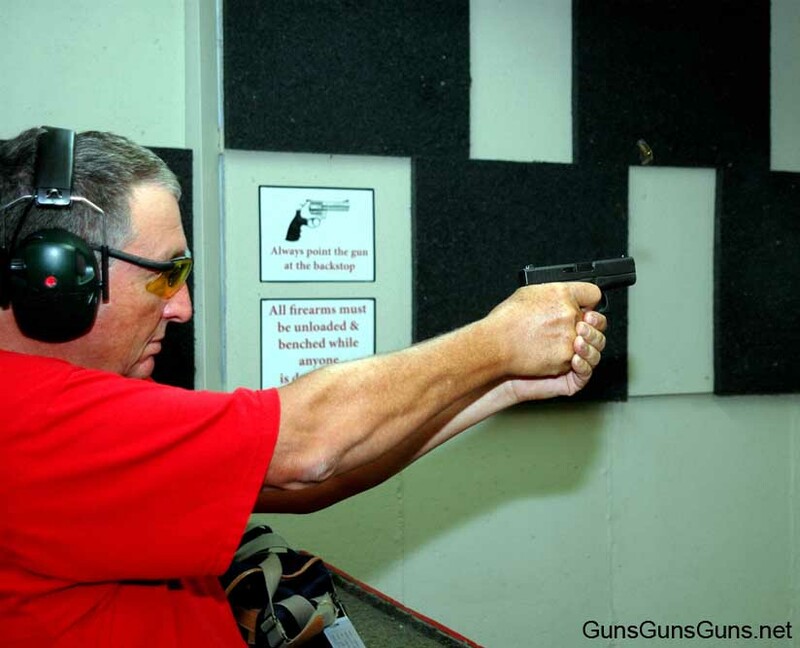 The first time out to the range with the Glock 42, my friend Irv Gill joined me. He choreographed the ammo, and he also shot for group while he was chonographing. Doing both, he was not pleased with his accuracy results. I thought they were good given that he shot at targets at 15 yards while also running the chronograph. He managed to get 3″–5″ five-shot groups with only a few flyers. These are good results even if you’re not distracted by running the chrono! Another friend of ours bought a 42 recently. After he took his wife to the range to shoot it, she carried home what has now become her pistol; he did the smart thing and bought another one. Finding a concealed-carry holster for the 42 shouldn’t prove difficult. Given its newness, you might not yet be able to find one specifically made for it. However, I found that a DeSantis Nemesis pocket holster and a DeSantis inside-the-pants, soft-leather rig made for the Ruger LC9/LC380 fit the 42. Both allowed me to take a full two-finger grip on the gun. Important: If you’re doing such a match up, make sure the 42’s squared and hooked trigger guard doesn’t keep the pistol slightly away from fully inserting into the holster. Gill’s target results (lower), and the author’s (upper). I see the 42 as quite suitable for most concealed-carry needs. Also, due in part to its short recoil system, the slide doesn’t require much strength to manipulate, making it quite attractive to anyone with lesser hand strength and/or physical ability. It’s also competitively priced, and of course Glock customer service is second to none. I will leave the size and caliber debates to others. Bottom line: This is a welcome addition to the Glock product catalog. The 42’s extractor and chamber hood. The trigger guard’s lower rear is relieved to create more grip room. 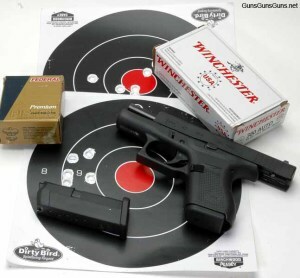 This entry was posted in .380 ACP, $251-$500, Glock, Semiauto, Subcompact and tagged Handgun Reviews on September 19, 2014 by Walt Rauch. One of the strengths of modern pistols is their carrying capacity. Why would I want to depend upon a 6+1? That’s even less than a single-stack 1911. If this is the option, give me the rock solid performance of a revolver. Looks like a great gun. Problem is a pocket gun it doesn’t have a safety or a longer trigger pull. As a 380 I cannot recommend this is a pocket gun. I’ll stick with my Kahr cm9. Thanks for the summary on this Glock42. I’ll have to read more on the dual spring coil assembly. I wish this was chambered for 9mm, with greater magazine capacity. 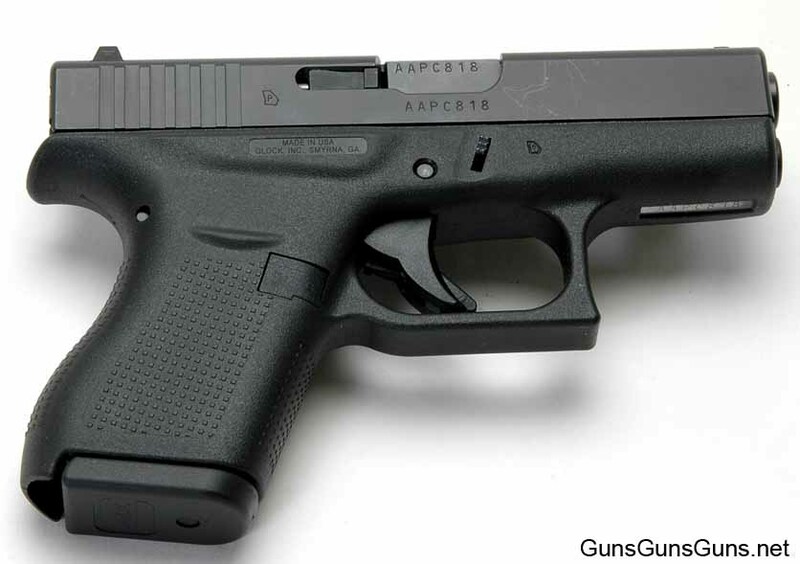 Or, at least, I wish Glock (or someone)would produce a (really reliable)12-15 round mag for this handgun that could be carried as a backup. Otherwise, I’m sure the G42 is up to Glock’s usual high quality and reliability. If and when Glock produces a higher capacity mag, I will probably buy this pistol. It is a bit large for a pocket gun, but it feels great in the hand. At seven rounds, it carries 2 more than my Airweight J frame, can fire +P ammo, and is 3 ounces lighter. It is half as thick as my Model 38 S&W. What’s not to like? Not sure why some don’t like it, but it is an excellent cc gun. Reliable, accurate, trigger is moderate, and muzzle flip a bit strong but able to handle. Action is moderate, not strong but not light. Sights are ok (typical small gun). But the grip is too short, so invested in several brands of extensions (no adnl rds) for the 6-shot mags, and all helped a lot (Pearce, NDZ, one other). Offset round storage in mag is slightly heavy to load, but do-able. Couldn’t find a loader that fit to help. Added a Pachmayr grip (like the one on my Kel Tec P32) and it helps also. Nothing fancy, just a good, solid cc gun, but only an ok pocket gun (size). Ate all the brands of ammo (12) I fed it except Taylor Ammo (?) found at my local range (their 9mm works fine in my 9mm guns), and doesn’t like most remanufactured ammo. Kinda wish for an extended mag that would hold at least 2 more rds, but that would affect cc.